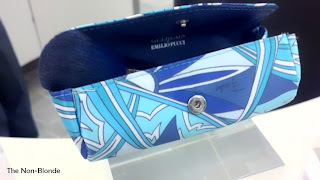 Bergdorf Goodman gave the press a sneak peek at the much-anticipated Guerlain Terra Azzurra Collection by Emilio Pucci for Summer 2012. 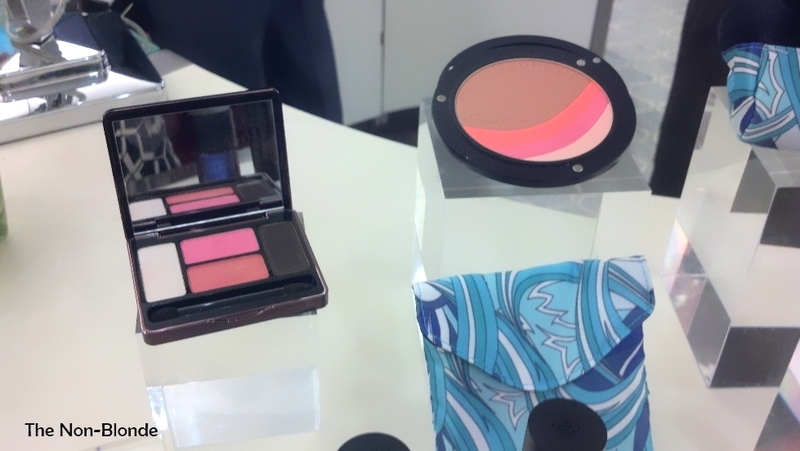 It's a limited edition makeup collection packaged in Pucci's Winter Capri print. It screams The Riviera and makes ready to don a headscarf and large sunglasses and go on a long vacation. I have a feeling this will sell out quickly, so I'm going to secure the items I want ahead of time. Terra Azzura Bronzing Powder & Blush ($75)- It's half Guerlain's Terracotta bronzer and half bright blush. Comes in a Pucci printed pouch. 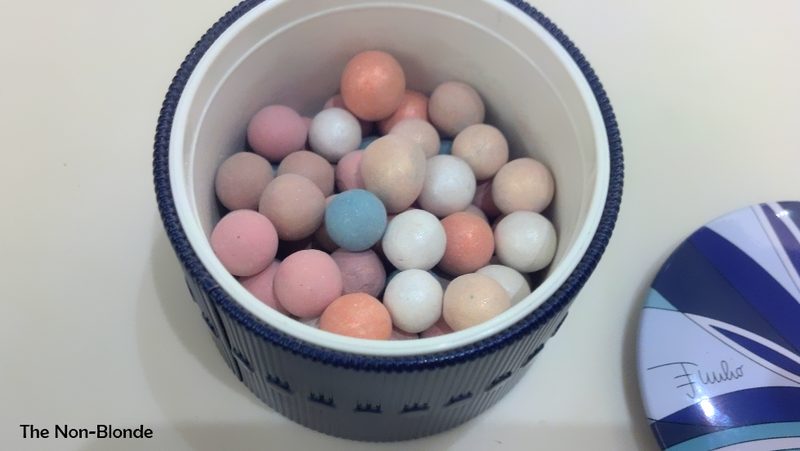 Meteroites Perles d'Azur ($58)- Guerlain's iconic powder pearls in a mix of blue, pink, beige, orange, ivory and gold. The packaging alone is a must-have, and even more so because I'm a Meteroites Perles devotee. Meteorites Pucci Collector's Brush ($38)- It's a blue and utterly adorable version of Guerlain's standard Meteorites brush. Comes in a Pucci pouch. 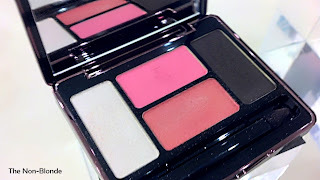 Ecrin 4 Couleurs Eye Shadow Palette in #13 Capri ($59)- Dark brown, ivory and two bright and warm shadesof pink and orange-red. Not my thing. Le 2 Mascara in #14 Blu Pucci ($36)- A bright blue mascara. Khol Kajal in #02 Blu Acqua ($36)- Intense indigo blue. 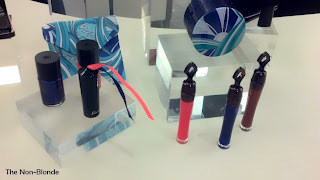 Terracotta Gloss ($30.50)- in three shades named after Pucci silk scarves: #10 Porto Fino (coral pink), #11 Porto Ercole (spicy brown), and #12 Porto Azzuro (crazy indigo blue in the tube, shiny and transparent on the lips). Terracotta Nail Polish ($22)- Very bold shades, though not necessarily unique: 01 Paradiso (coral pink), 02 Riviera (metallic indigo blue). What do you think? Anything on your pre-order list? I apologize for the cell pictures (and Bergdorf's frustrating lighting). One day I'll remember to actually take my good camera with me to events like this. You can see the press photos on Temptalia. Wow, this is a stunning collection. I agree with you that this says sophisticated French summer. Thank you so much for sharing. I am curious about the blush and will definitely get the Meteorites pearls. I would love to get the bronzer/blush and the meteorites (I love them) and possibly the brush now that you've pointed it out. 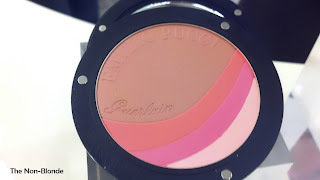 Just love Guerlain. I am going to have to have those meteorites. Have been using them more lately as my finishing powder. Amazing how it makes my blush last longer. That blue print is to die for. I need a scarf in that print. One of the Russian blogs had promo pictures and actual swatches of several of the pieces about 4 weeks ago. I've been drooling ever since :-) The bronzer/blush, Météorites, coral pink lip gloss, and the eye quad are on my "must have" list.